The kit brings a new standard of acoustic drums to Groove Agent 5. Recorded in Berlin's Teledex studios, including its classic reverb chamber, it features over 14 GB of compressed audio, 37,000 samples, 3 different overhead microphone positions and 20 new presets for rock, funk, jazz, and much more. Whether it's heavy-hitting Trap bangers, raw and dusty hip-hop drums, breathtaking EDM inspired kits or speaker-ripping Future Bass kits: Groove Agent 5 takes modern productions to the next level. The new kits now also include additional samples like basses, brass and melodic loops. Groove Agent combines the creative power of three different rhythm modules: the Acoustic. Beat and Percussion Agents, which can be loaded in four slots. 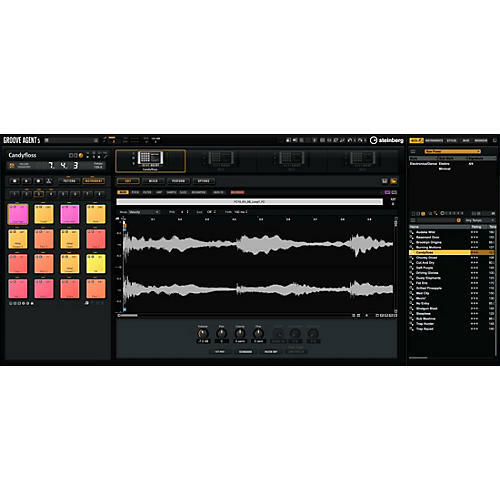 Each Agent can be combined with any of the others for layering and creating your own unique drum sound. All 1,000 MIDI grooves were played by top drummers and mixed by Steinberg's expert engineers helping you to easily find the perfect backbone and groove for your song. Evert MIDI part can be exported to your DAW of choice or manipulated in Groove Agent's Style Player. A huge collection of percussive loops and instruments brings you the organic energy of bongos, congas, shakers, chimes, claps and more. Thanks to Perform mode, you can establish a completely new rhythm section, perfect for songwriter backing, funky tunes or creating hybrid styles. Lifetime tech support. Warranty terms vary. Check with manufacturer for specific product warranty.